Fill a saucer with salt. Wet the rims of individual glasses with lemon slices and dip in salt. Set aside. 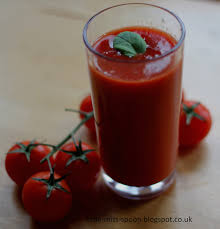 Bled the tomato juice, celery salt, pepper powder, garlic and tobasco sauce till smooth.Add crushed ice and blend again. Strain into salt-rimmed glasses and serve chilled with celery stalks or swizzle sticks.